During the bankruptcy process, the Bankruptcy Law Offices of James Schwitalla, P.A. will identify your unsecured debts and your secured debts. Unsecured debts (such as credit card debts and medical bills) are dischargeable. 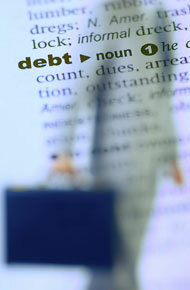 Certain types of debts are not dischargeable. The good news is that by eliminating the dischargeable debts, you can free up cash flow that can be used to pay down your non-dischargeable debts and secured debts such as your car payments and home mortgage payments. Call us at (305) 278-0811 to schedule a free consultation. We can review your situation and discuss the actions we can take to work to eliminate your debts and help you get a fresh financial start through bankruptcy. Some older IRS tax debts can be discharged entirely. Whether your income tax debts can be discharged depends on the tax year of the tax, when the return was filed, how long ago the tax was assessed, and whether there was an audit and a later tax assessment. James Schwitalla is an experienced bankruptcy attorney, who can review your situation and advise you regarding the possibility of discharging your tax debts. He has over 18 years experience helping clients obtain debt relief and will work to help you make a new financial beginning. Call (305) 278-0811 or Send us an e-mail to schedule a free consultation with an attorney at the Bankruptcy Law Offices of James Schwitalla, P.A. The hiring of a lawyer is an important decision that should not be solely upon advertisements. Before you decide, ask us to send you free, written information about our qualifications and experience. We are a debt relief agency. As bankruptcy attorneys in Miami, we help people file for bankruptcy relief under the Bankruptcy Code.